AHHHHH! 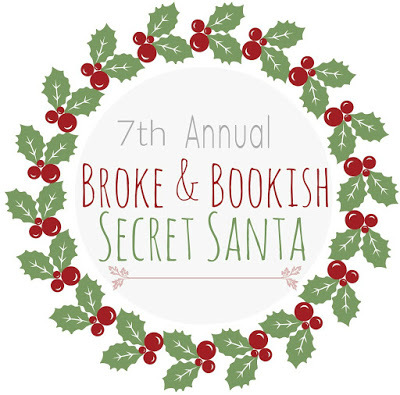 I just signed up for The Broke & The Bookish Secret Santa! I’m so excited for this. So freaking excited. This is my second year participating. I had such a great experience in 2015. I’m thrilled to be able to participate again. This Secret Santa gift exchange is hosted by Jamie at www.brokeandbookish.com. This is it’s 7th year. Last year over 400 people participated. Basically, it’s all about the bookish community celebrating their love of books and the generosity of the Christmas spirit. You can sign up for different levels of gifts (1 book, 1-2 books, 2+ books) and, along with your book(s) you include a few goodies. I had so much fun last year. I made new friends, both through giving and receiving gifts (Melissa and I still chat on instagram and twitter!) and through following the hashtag (#tbtbsanta) and joining in on the Twitter chats. And, I got an amazing gift. I was also able to send a fun gift of books I love to a new friend. If you’d like to participate in #tbtbsanta, head over to The Broke & The Bookish to sign up! Sign ups close at 11:59 pm EST on November 12. Just joined. Super excited and so glad I saw this!